If you have a PowerBook or MacBook made in 2007 or later, your built in soundcard will not be capable of recording and playing back audio simultaneously without doing some extra configuration. 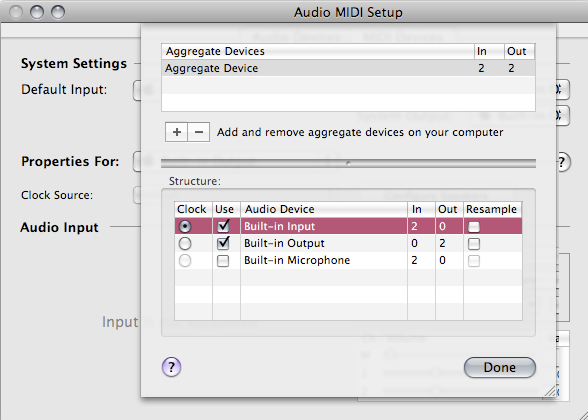 You must use the Audio MIDI Setup application to create an Aggregate Device, which is essentially one virtual soundcard made of of two or more physical soundcards. JACK will then connect to this virtual soundcard and have both input and output channels. 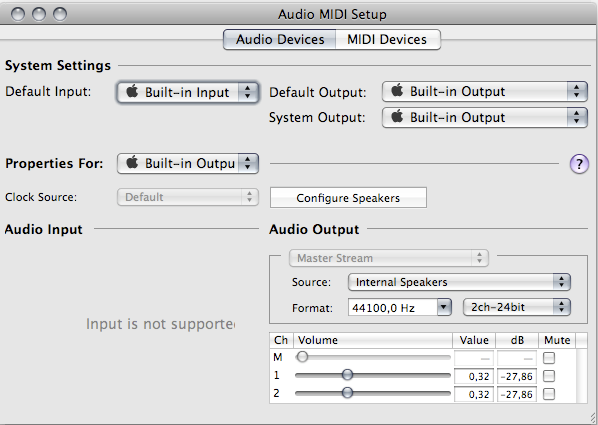 The OS X 10.6 ("Snow Leopard") Audio MIDI Setup utility differs from the one shipped in earlier OS X versions. 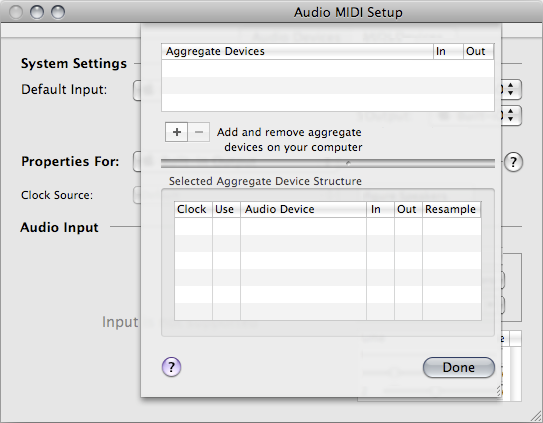 Audio Devices and MIDI Devices are listed in separate windows. 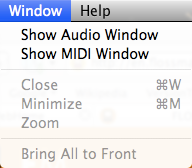 Double-click the Audio MIDI Setup icon, as depicted in the OS X 10.4/10.5 instructions, above. 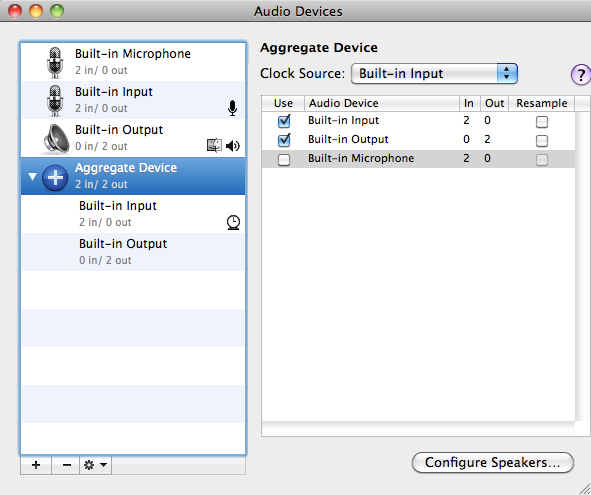 If the Audio Devices window does not appear, choose Window > Show Audio Window. The Audio Devices window lists the audio devices on the left, and the pane on the right shows the properties of the selected device. To create a new aggregate device, click the small + button in the bottom-left corner. Next, add the Built-In Input and Built-In Output to the aggregate device by checking their respective boxes in the Use column. Clicking the triangle in front of the Aggregate Device icon lists the aggregate device's component devices. By double-clicking the words 'Aggregate Device' in the list, you can rename your new Aggregate Device. If a JACK server is running, a JackRouter device appears in the list of audio devices. 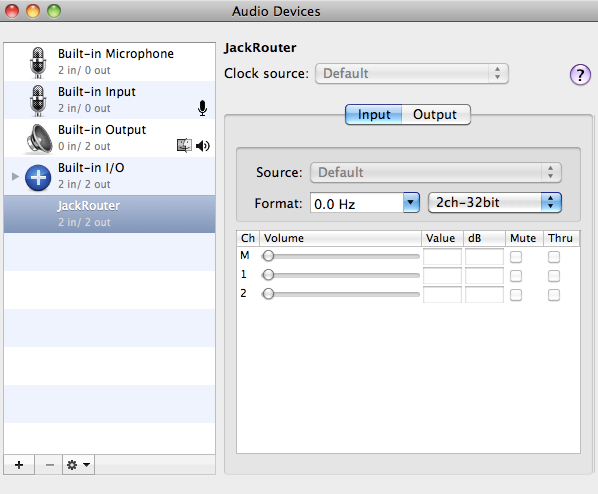 The JackRouter device is an internal virtual audio device. 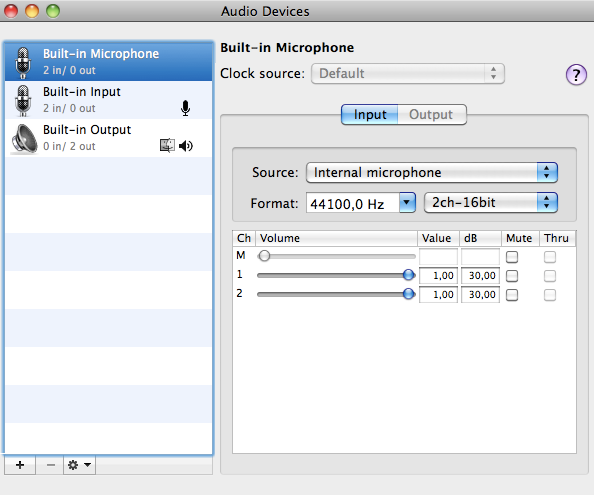 Although it has no physical connection to any input or output, you can use it to route audio to and from Ardour, from and to other applications.